Dishonest dealers in Kenya are now repackaging various alcohols and selling them off to unsuspecting buyers. The scam appears to target a broad range of popular spirits, including Smirnoff Vodka and The Famous Grouse Whiskey. Various residents have reported that the drinks are sold in shops in down-town Nairobi and cheap clubs. Popular drinks are either substituted with similar looking forms of alcohol or blended with them. Vodka is substituted with chang'aa , a local moonshine drink while brandies are used to dilute, or wholly sold off as more expensive whiskies. There is suspicion that some of the alcohol used in this drinks is diluted industrial alcohol. Industrial alcohol is normally cleared, with tricks such as food colouring and perfume deployed to have the counterfeit alcohol look like the genuine one. The syndicate appears to be recycling bottles which are collected from garbage dumps, especially in Nairobi Eastlands areas. Consumption of such alochols is high to provide a steady supply of enough bottles for the counterfeiting. 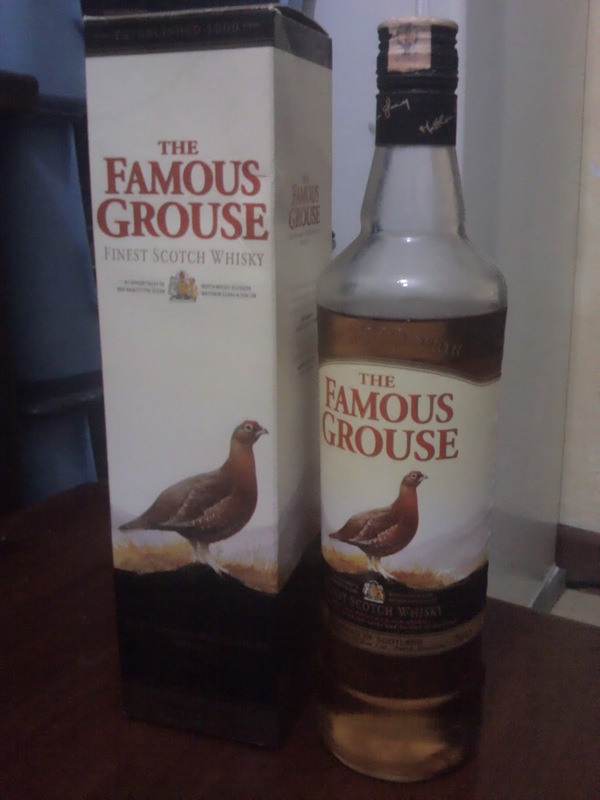 Genuine The Famous Grouse . the design is award winning. on the three sides of the box. There also appears to be some form of manufacturing as packaging material for the alcohol, including caps , labels and boxes. The material often differs from the genuine brand in colour, wording and imagery. 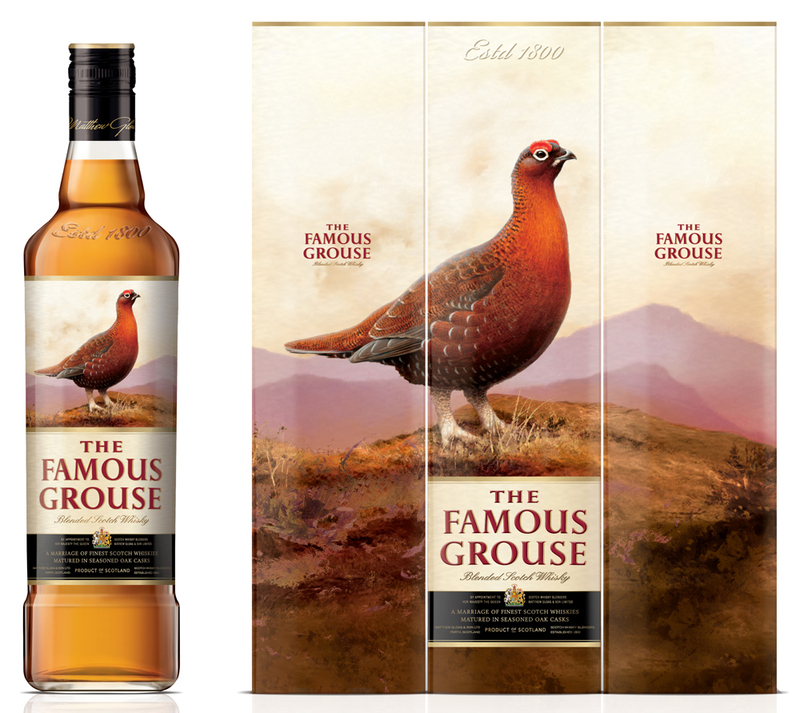 As an example, the counterfeit The Famous Grouse has the imagery of the grouse on three sides of the box, rather than a single bird on three sides. On careful observation, the labels also appear to be stuck with normal glue. 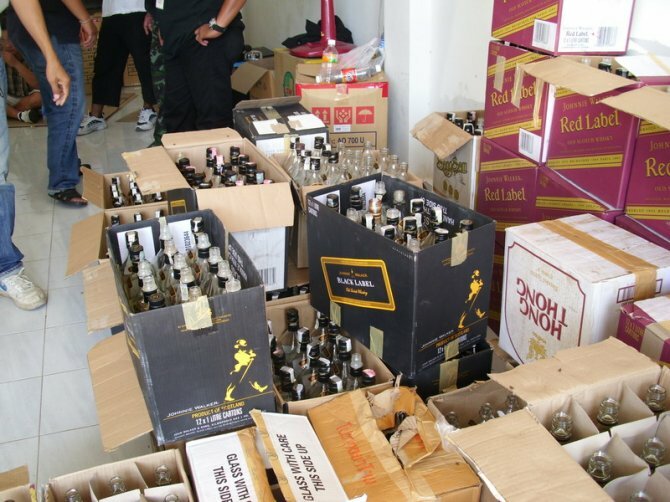 For other drinks, it is hard to differentiate the counterfeit and genuine ones as they normally do not have other forms of packaging, other than the bottle. Normally, more costly spirits feature a refill-proof plastic contraption that is fitted into the neck of the bottle just below the mouth. A non-refilled bottle should have a ball in the plastic contraption that jiggles when the bottle is shaken. Counterfeiters have gotten around this feature by removing the ball, refilling the bottles and then sealing them again by fixing a plastic fitting using super glue. This means that one has to break the small plastic fitting in contrast to a genuine spirit where the bottle has to be tilted at an angle for the drink to flow out. 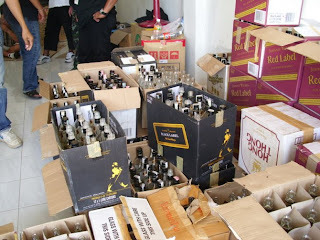 Notable outlets stocking counterfeit alcohol include two spirit stockists along Dubois road , off Accra Road. Here, 750 ml bottles of spirits including The Famous Grouse and Johnnie Walker retail at Ksh 1,300 compared to supermarkets where the drinks start at about Ksh 1,700. East African Breweries directly retails Johhnie Walker at about Ksh 1,400. When contacted, Viva Distributors, who are in charge of distributing The Famous Grouse in Kenya, did not seem shocked and handled the matter casually. The far east , with a burgeoning middle class, is notorious for rackets that specialise in counterfeit liquor , especially in China and Malaysia. In 2010, China was rocked by a fake wine scandal where wines consisted of nothing but water and chemicals.